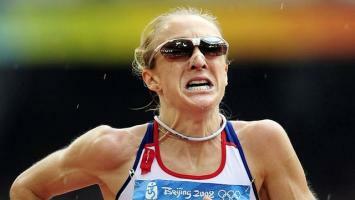 See the gallery for quotes by Paula Radcliffe. You can to use those 5 images of quotes as a desktop wallpapers. I try not to worry about things that I can't control. I'm confident of what I have to achieve in the buildup to London 2012. I've always been good at putting things behind me - I fall apart, do my crying bit and then put it away and move it. I've been to three Olympics and I don't feel I've ever quite achieved my best at any of them. Plenty of people who are 38 have run really well in the marathon. A half marathon is a good way to have a bit of fun and race against those girls and learn a bit more about them.The world half marathon is a world championship at the end of the day and it's important. I've win it twice and it's a quality event. An Olympic medal won't define my whole life, although it might look like it to onlookers. When I look back, I should have been able to get an Olympic medal. I deliberately returned slowly to training after Raphael was born and everything, apart from being bitten by a dog whilst out training in Monaco at the beginning of the year, has gone pretty well. I have achieved a lot and I'm grateful for that - I'm just a bit greedy because I want to add the Olympics. It's once every four years - everyone wants it and very few people get it. I have always loved running on the roads, ever since I used to take part in relays for my club when I was 12 and 13. I felt really at home on the surface. 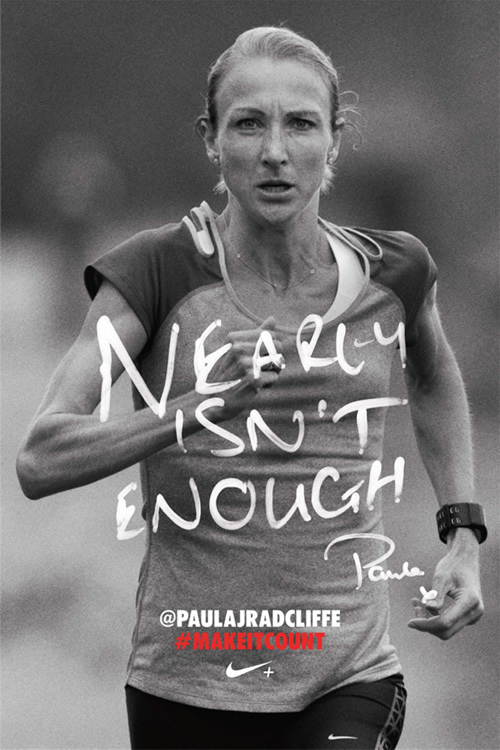 Much more quotes by Paula Radcliffe below the page. I have not had the chance to go out there and do myself justice in an Olympic marathon yet. I have not been able to get to an Olympic marathon injury-free yet. I took a lot of bad things after Athens. I just learnt to deal with it. 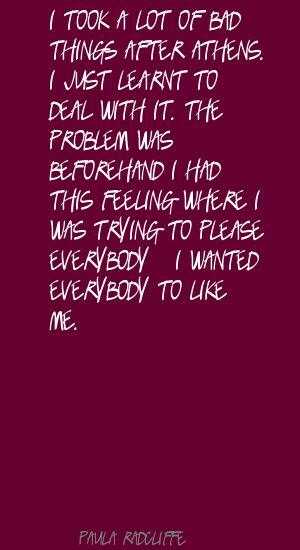 The problem was beforehand I had this feeling where I was trying to please everybody - I wanted everybody to like me. 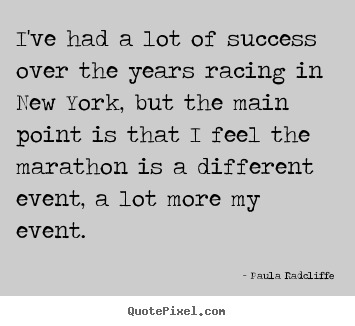 I've had a lot of success over the years racing in New York, but the main point is that I feel the marathon is a different event, a lot more my event. If you look back at my marathons and ask whether I would swap one of them for my one balls-up, of course I would. But you can't choose. You have to make the best of it on the day. To represent your country at a home Olympics is something special and I'm over the moon to be selected for Team GB. I was pleased to get the qualifying time in Berlin earlier this year and my sole focus is getting in the right shape for London. You can wish as hard as you like but all that really matters is the shape you're in on the day of the race. I've always felt these really big races aren't necessarily won by whoever is the fastest. They're won by the athlete who is the smartest and in the best shape on the day. Yeah, ideally, I'd probably wish to be more anonymous. But scrutiny and success go together. And I want to be successful. Actually I don't choose to expose myself in public. I choose to compete; the other side just comes with the package. At big championships it's not the fastest person, it's the person who gets it right on the day. I actually got a nice surprise about being a mother because I expected it to be harder and to have to make more adaptations. I apologise to people when I need to. I can swim I'm not bad, but not great. I don't feel guilty in having pleasure! I don't like going away from my children. I have always run as hard as I can. You are not going to run any harder with or without men. You are running on your own two feet. I prefer just a women's race. It's a totally different game mentally. Indeed if we Christians so tell our story that Judaism is silenced, then we have not spoken rightly of Christ. The medieval Church believed that the resurrection of Christ marked a new time for all of humanity. Thinking that morality is all about commandments is a relatively new way of thinking, since the Reformation. We can identify with Frodo and Sam, setting off not knowing quite where they are going and what they are to do. What can the Church do? If she stands by her moral teaching, then she will be seen as standing in judgement over a vast percentage of Europeans. Despite all the lunacy of the last century, all the absurdity of war and genocide, we believe that humans being are rational and are made to seek the truth. I can't pretend to be objective when it comes to service or sacrifice. I don't want anything bad to happen to me. I try so hard not to think that I am a stranger in a strange land. But I know that I stand out. I will stay in the car until the last minute that I'm going to jump out and do a standup or jump out and do some interviews. I have two children. They're grown children. I don't think they particularly enjoy it when I'm in a dangerous situation, but they also understand that this is something I feel strongly about. It's what I've done my whole life.